Blackrod was a township and village in the Union and County Court District of Wigan, the rural deanery of Bolton, the Diocese of Manchester and the Hundred of Salford. The township or civil parish was in Lancashire and the ecclesiastical parish was in Bolton le Moors. A Local Board of Health for the township of Blackrod in the Parish of Bolton and the Wigan Poor Law Union was formed in 1872. Blackrod Urban District Council was established in 1894. 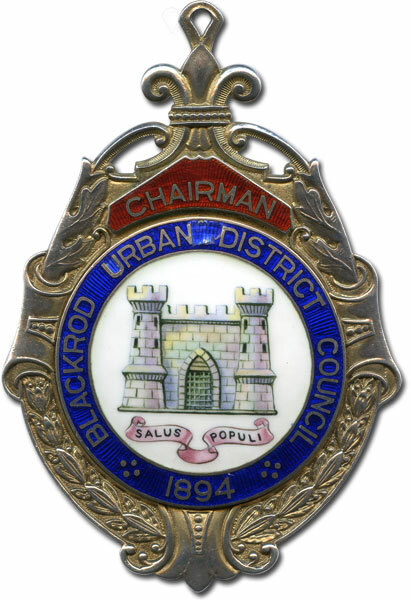 Badge of the Chairman of Blackrod Urban District Council, now worn by the Deputy Mayor of Blackrod. The whole of Blackrod became part of Bolton Metropolitan Borough in 1974. Blackrod Town Council was also created in 1974 and each year elects its own Town Mayor.